Select Home Warranty provides warranties on home appliances and systems for homeowners, people involved in real estate transactions and real estate agents. The company’s US headquarters are located in New Jersey, but they also have offices in London. Select Home Warranties provides consumers with three home warranty plans to choose from. The Bronze Care plan covers appliances, like the clothes washer and dryer, garbage disposal, refrigerator, stove, oven, built-in microwave, cooktop and dishwasher. While the Gold Care plan provides coverage for systems, including heating, plumbing and electrical systems, and also water heaters, ductwork, and air conditioning. The Platinum Care plan combines the coverage of both plans, and also includes additional plumbing care, garage door openers and ceiling fans. Consumers can also add coverage for their pool and/or spa, central vacuum, second refrigerator, sump or well pump, roof leaks, stand alone freezers, in-refrigerator ice maker, lawn sprinkler system, septic system, lighting and plumbing fixtures, and additional air conditioning units, furnaces and water heaters. Select Home Warranty often has coupon code savings, which can include perks like lower premiums, free months or complimentary additional coverage. Check their “Plans” page to see what they are currently offering. To make a claim, policy holders must contact Select Home Warranty through their online claims system or by calling their hotline. In theory, Select Home Warranty then provides the customer with a contractor who will diagnose the issue, to which a $60 service fee must be paid at the time of the service. However, if Select Home Warranty doesn’t have a professional with the required skills, they will ask the policy holder to find their own, and get reimbursed for the cost of the service. A reoccurring complaint from Select Home Warranty policyholders is miscommunication about processes. On certain occasions, they were told to make arrangements for contractors to come, because the company was taking to long to provide them. The representatives told them they would be paid back for the cost of the service, but reimbursements were denied. The core of this issue seems to be that Select Home Warranty does not have a sufficient number or variety of independent contractors in some locations. This, combined with lack of informative customer service, frustrates many of the policyholders who made complaints. With the above in mind, there were also many consumers who say they received quick and efficient service from the professionals provided by Select Home Warranty. Also, while slow or inefficient customer service has been outlined by some in public forums, their concerns were often addresses and resolved by representatives from Select Home Warranties. Select Home Warranties provides consumers with three home warranty plans to choose from for home appliances and systems. 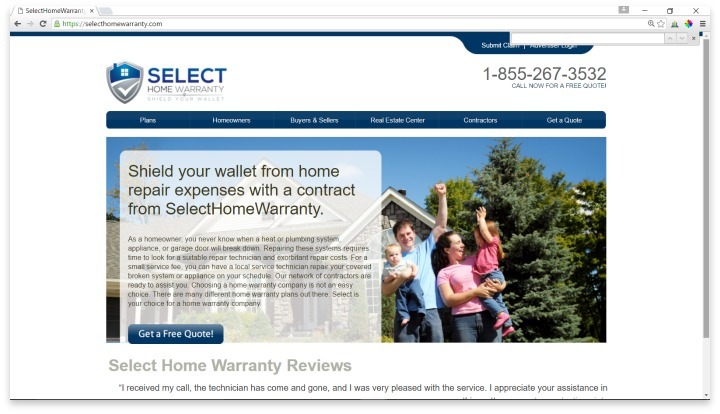 Select Home Warranty has a shaky reputation, and there’s not much information about the company as a whole. Complaints of lack of in-network service professionals raises concerns. While it is nice that some consumers get to choose their own contractor, it ends up being a financial risk due to the possibility Select Home Warranty won’t provide a reimbursement. Consumers should ask questions about the contractor network in their region before committing to a home warranty with Select Home Warranty. Have you had an experience with this company? Please share your Select Home Warranty reviews below. Hands down the worst warranty company out there. They will do everything possible to deny your claim. they even admitted that my loss would have been covered, but because of a paperwork issue in filing the claim, they denied it. Do not waste you money on this garbage. They should be put out of business! - CONS: This company is a complete scam. They should be put out of business!